Oxy-acetylene HVAC Port-A-Torch?outfit. The HVAC Port-A-Torch? contains all the quality equipment needed for brazing. 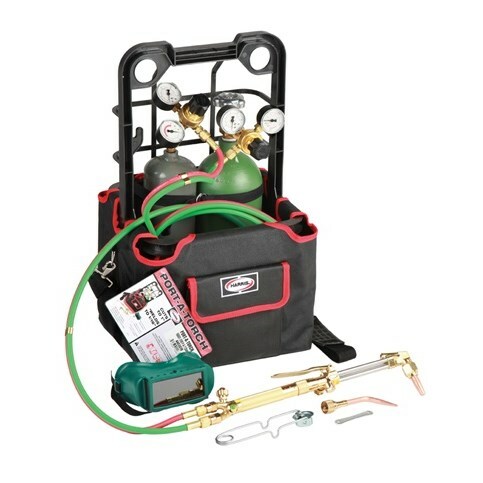 Packaged in a rugged, molded plastic carrying case, the brazing handle and cutting attachment have industry-standard connections making them compatible with most brazing equipment. The outfit is designed to carry one MC acetylene cylinder and one 20 cu. ft. oxygen cylinder. The outfit is capable of cutting up to a 1? plate and welding up to a 1/16?plate with the supplied tips. It can cut up to a 4? plate and weld up to a 1/2? plate with optional larger tips and an acetylene cylinder.